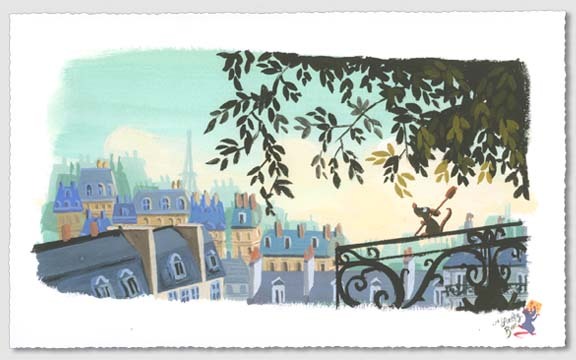 The Flavor of Paris is a great Ratatouille image by Lorelay Bove, who worked as a visual development artist on the film. The art is remarqued and signed by the artist. 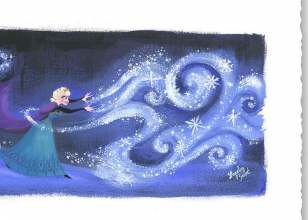 After making her entry into the business as an art intern at Pixar Animation Studios, Lorelay quickly transitioned into her current role as a Visual Development Artist at Walt Disney Animation Studios. 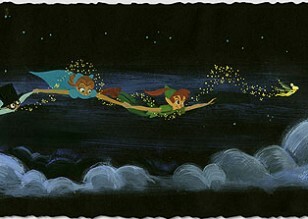 In addition to her influential roles in the visual direction and development of The Princess and the Frog ,Tangled, Winnie the Pooh, and Prep and Landing for which she designed backgrounds, characters costuming, color scripts for numerous sequences, and countless other elements, she is also known for providing the illustrations for the Little Golden Book The Princess and the Frog title, as well as Toy Story: Ride 'em Cowboy! 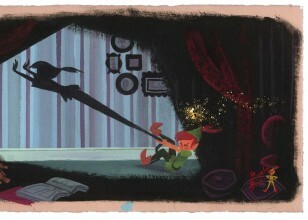 Her work was featured at the New Orleans Museum of Art's exhibition of Dreams Come True: Art of the Classic Fairy Tales from the Walt Disney Studio as well as countless other art exhibits worldwide. Ratatouille is a 2007 American computer-animated comedy film produced by Pixar and released by Buena Vista Pictures Distribution. It is the eighth film produced by Pixar and was co-written and directed by Brad Bird, who took over from Jan Pinkava in 2005. 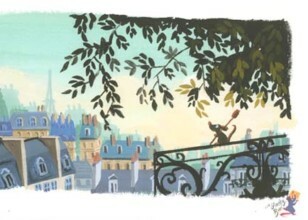 The movie takes place in Paris. The title refers to a French dish, "ratatouille", which is served at the end of the film and is also a play on words about the species of the main character. The film stars the voices of Patton Oswalt as Remy, an anthropomorphic rat who is interested in cooking; Lou Romano as Linguini, a young garbage boy who befriends Remy; Ian Holm as Skinner, the head chef of Auguste Gusteau's restaurant; Janeane Garofalo as Colette, a rôtisseur at Gusteau's restaurant; Peter O'Toole as Anton Ego, a restaurant critic; Brian Dennehy as Django, Remy's father and leader of his clan; Peter Sohn as Emile, Remy's older brother; and Brad Garrett as Auguste Gusteau, a recently deceased chef. The plot follows Remy, who dreams of becoming a chef and tries to achieve his goal by forming an alliance with a Parisian restaurant's garbage boy. Ratatouille premiered on June 22, 2007, at the Kodak Theatre in Los Angeles, California, with its general release June 29, 2007, in the United States. The film grossed $620.7 million at the box office and received universal acclaim. The film later won the Academy Award for Best Animated Feature, among other honors and it was later for 2016 poll of international critics conducted by BBC, Ratatouille was voted one of the 100 greatest motion pictures since 2000.